When Dave Eggers wrote A Heartbreaking Work of Staggering Genius, a hilariously depressing (depressingly hilarious?) autobiography about taking care of his younger brother after both his parents died, he was thought of as the next big thing. With successive books, he began sinking into that "too clever for his own good" category. Then Eggers found his voice. Eggers has always been a great guy, and has created writing and tutoring centers for underprivileged youths (826 Valencia), but his writing did not keep up with his philanthropic endeavours. Then in 2006 he wrote What Is the What, a book about Valentino Achek Deng that puts a human face to the Lost Boys of Sudan in the same way A Diary of Anne Frank did for Holocaust victims. The writing was straightforward and elegant, as if Eggers knew the story was remarkable enough that it needed no embellishments. Eggers continues that trend with Zeitoun. This true story about what happened to a Muslin-American trying to save himself and others in post-Katrina New Orleans should be required reading in all American History classes. In Abdulrahman Zeitoun, Eggers again puts a face to one of the greatest tragedies of our time. Make that two. 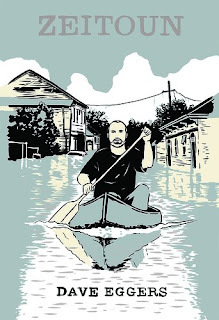 After surviving the hurricane, what Zeitoun is forced to go through as a Muslim is as reprehensible as what we did to Japanese-Americans in World War II, possibly more so. The fact that the rest of the country has hardly even heard of these atrocities only adds to the depravity of this part of American history. You owe it to yourself to read this book. When you are done, you will feel angry and exhausted, but will continue to have faith in the human spirit. This is a masterpiece. Elizabeth Dulemba Is Coming To DBF!!! Who Else Is Coming To DBF??? Aimee Friedman Is Coming To DBF!!! Art Roche Is Coming To DBF! Kate DiCamillo Is Coming To DBF! Laurel Snyder Is Coming To DBF! Laura Vaccaro Seeger Is Coming To DBF! Chris Schweizer Is Coming To DBF! Loren Long Is Coming To DBF! James Dean Is Coming To DBF! mElissa conrOy is cOming tO dbf! David Lubar Is Coming To DBF! A Very Special Skippyjon Jones Brunch!!! Tim Byrd Is Coming To DBF! Alan Gratz is coming to DBF!